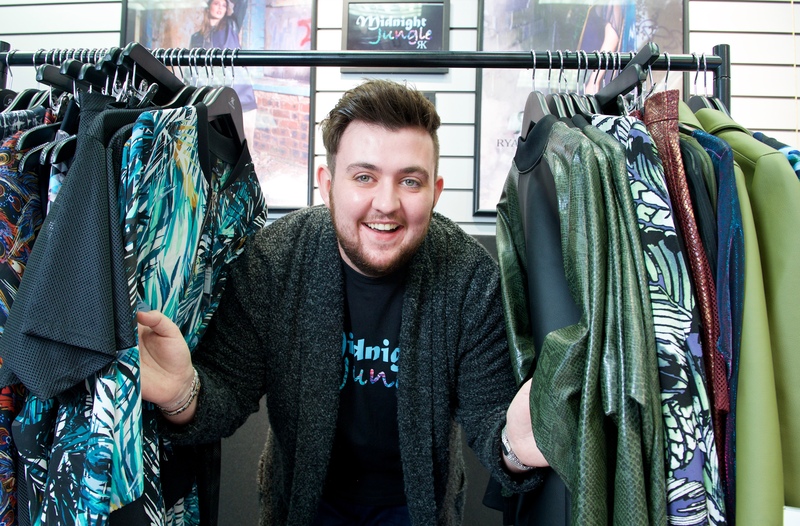 Fashion designer Ryan Kirk (24), from Crossgates, studied at the illustrious Heriot Watt School of Textiles & Design. On graduating in 2015, he launched his own label and immediately dressed one of the X-Factor finalists. What do your business do? I am a fashion designer, producing ‘made-to-order’ items from my collection. I also offer a bespoke service. How and why did you start in business? During my fashion studies, I always knew that I wanted to have my own fashion label as I feel it’s such a massive achievement to say you own your own business. How did you get to where you are today? I think you need a lot of patience and perseverance, both in my line of work and also with starting your own business. My label has only been officially launched for about a year and a half and its still very early days for my brand. I actively promote via Instagram (@ryankirkdesigns) and I feel good word of mouth is key for any new startup businesses. Who has helped you along the way? My parents, family, and amazing fiancé Vikki have been a massive help to me; I definitely couldn’t have done it without them. Business Gateway Fife also offered me a small grant, which helped with the initial startup material I needed to launch the brand. Marissa at Business Gateway has been a great supporter of my label from the start. We are in frequent communication which has helped build my confidence and provided me with a sounding board. Thanks also goes to the fashion department at Fife College for allowing me to promote at their events. What was your biggest mistake? I feel I rushed the initial website when I started. I was desperate to get a website up and running and new pieces on there. I wish I had taken a little bit more time to create a more cohesive collection. What is your greatest achievement to date? Currently, my new collection ‘Midnight Jungle’. It’s the first cohesive collection I’ve done since graduating. It feels so good to get back to designing, sourcing new fabrics, and bringing a new collection together. My ‘Black Scooped Hem Mesh Dress’ was worn in Alien Uncovered’s music video for their cover of Starboy (they were an X Factor finalist group in 2015). The item was also worn at this year’s London Fashion Week by the group. What do you hope to achieve in the future? I hope to become a well-known Scottish fashion label. I offer the same service as high-end retailers/designers but without the premium price tag. All of my items are handmade by me and I’d love for people to get behind the label and become a Ryan Kirk Designs lover and really appreciate the craftsmanship that goes into the items. Do you want to recruit in the future? I’d love to recruit in the future. I hope the brand continues to grow, both with the collections and bespoke service and people continually begin to purchase from the brand. I’d also love to get my label stocked across the world. What is the hardest thing about running your own business? For me, it’s finance. The amount of money spent on fabrics, the website and other materials can sometimes feel endless. Any advice to wannabe entrepreneurs? Go for it! It’s a risk but if it’s something you want to do then definitely go for it. There’s so many rewarding aspects to having your own business – and speak to Business Gateway Fife before you get started. How would your friends describe you? Funny, friendly, reliable, supportive, and approachable. Favourite film and book? I’m too indecisive to choose but I love a good horror. How do you relax? I’m a homely guy so the best time to relax for me is being at home, lighting some candles, and watching a movie on the sofa with my fiancé.